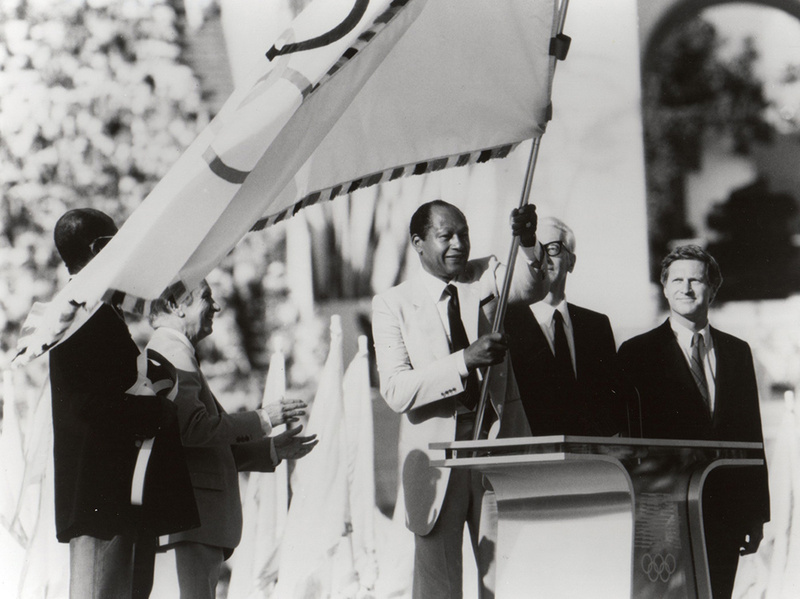 Transplants to Los Angeles in the early '90s may have had little-to-no exposure to its mayor, Tom Bradley, until his televised appearance during the Rodney King Riots of 1992. If that is the case, it would be an unfair moment from which to judge a man who served a record five terms as the mayor of the City of Angels. What we saw on the television screen that night was a man who looked as if he was being held hostage. Glassy-eyed, his speech stilted, he seemed at a loss to find a balm for his adopted city. He understood the community's outrage and frustration, and it must have seemed like the Watts Riots of 1965 all over again, but this riot wasn't an indictment against its civic leader; it was a groundswell of indignation and rebellion against a police force that targeted African-American men—like Bradley. For Bradley, a former police officer, it was a reaction that he could well understand, but never condone. It took the presence of the National Guard to restore order, and Los Angeles slowly returned to business as usual. 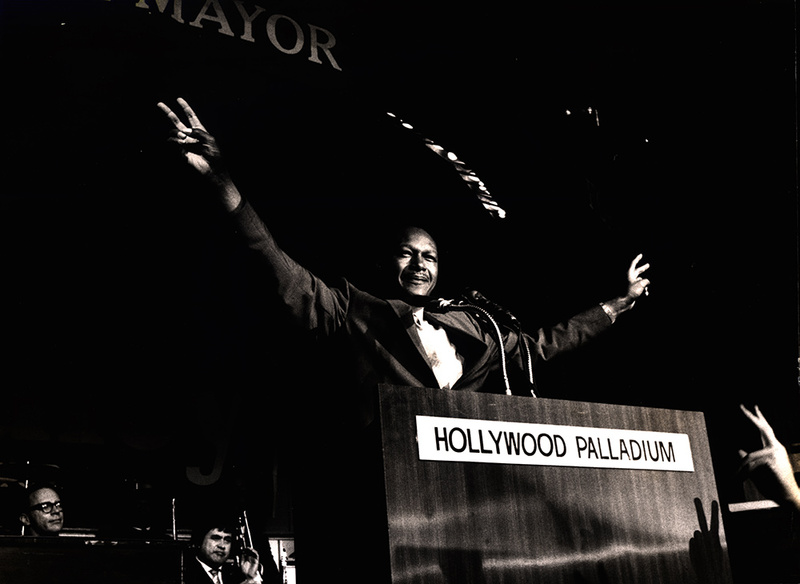 There were other issues at play for this newer wave of civic unrest, but perhaps those are topics best left for another article, or better yet, for two documentaries that examine the dual journey of Tom Bradley and his city, Los Angeles. Filmmakers Lyn Goldfarb and Alison Sotomayor started their work on the documentaries, Tom Bradley's Impossible Dream and Bridging the Divide: Tom Bradley and the Politics of Race, back in 2008. While varying slightly in running time and the linearity of their storytelling, both versions were shot by cinematographer Michelle Crenshaw. Bridging The Divide, narrated by Alfre Woodard, edited by Lillian E. Benson, A.C.E., and Stosh Jarecki, and scored by Stephen James Taylor, with a running time of 56 minutes, is scheduled for national broadcast in February on PBS, and Tom Bradley's Impossible Dream, with a running time of 46 minutes, has already started being utilized in high schools throughout Los Angeles. Finished in early 2014, Tom Bradley's Impossible Dream was narrated by Shari Belafonte and edited by Alejandro Valdez-Rochin, and was the iteration best suited for educational purposes. Concerned that Bradley's legacy was being overlooked in local classrooms, the filmmakers donated this shorter documentary to all 150 high schools within the Los Angeles Unified School District. For ease of implementation, it was accompanied by a comprehensive 11th grade history curriculum and a 12th grade government studies curriculum. The film has also been featured at various community screenings throughout Southern California. "Documentary is a powerful medium that changes people's lives and minds," Sotomayor maintains. "I knew that committing to making this story would do that. Bradley's story resonated with me. It had elements of a dramatic and inspirational film; it was a story of triumph and tragedy, courage and community." Research for both documentaries spring-boarded from Sotomayor and Goldfarb's work on a previous documentary from the 2006 series California and the American Dream. The segment, The New Los Angeles, was produced and directed by Goldfarb, researched and associate-produced by Sotomayor, and was broadcast nationally on PBS. Since both filmmakers had decades of experience between them, with a previous Academy Award nomination for the documentary With Babies and Banners: The Story of the Women's Emergency Brigade, which Goldfarb produced, and two Emmy wins for Sotomayor during her tenure as a producer for KCET's Life & Times, this new project should have been a sure thing. "Obama was running for president, and we said, 'Boy, this is the time to do the Tom Bradley story,'" Goldfarb reflects. "We're not going to have any problem raising money because a lot of people believe that Tom Bradley laid the foundation for the election of Obama." But then the financial crisis of 2008 came along. Agreeing to start work on the project without pay, the filmmakers persevered, eventually earning an initial grant from the W.K. Kellogg Foundation, but, as Sotomayor notes, "It was a long, long while until that first grant was awarded." When they started the research for their project, it came as a surprise to Goldfarb and Sotomayor that, aside from a few written biographies, the story of Tom Bradley had not been told. Digging even further, it became evident that Bradley's legacy was not only being neglected in LA's classrooms, it was also all but omitted from the history books, and when his story was revisited by the media, it was being grossly distorted, especially by the pundits during Obama's 2008 presidential campaign. As noted earlier by Goldfarb and voiced in the documentary's interviews, it was widely believed by those who remembered Bradley's victory in 1973 that he laid the groundwork for the sort of coalition- and community-building that Obama deployed when he ran for president. It is conceivable to theorize that without Tom Bradley there may not have been a President Obama. Both men had succeeded in swaying not only the diverse constituency of the minority vote, but also a healthy majority of the white vote. Echoing the same type of alliances that helped Bradley and Obama get elected, Goldfarb and Sotomayor began to assemble their own diverse team of filmmakers, scholars and academic advisors from various ethnic and cultural backgrounds to work on the Bradley documentary. "We formed a multi-racial coalition of people who contributed their own perspectives, voices and life experiences to the project," says Sotomayor, who herself grew up in East Los Angeles. "It was important to have people coming in and saying, 'Don't stereotype, don't jump to conclusions, let's take a step back,'" Goldfarb adds. "It may be easier to say something one way, but is that the most correct way to say it? When you bring different points of view to the table, it makes a stronger and richer film." "Tom Bradley's story raised important issues about race, police brutality and building bridges over racial divisions," Sotomayor explains. "This film is especially important at a time when the nation is at a tipping point in the struggle against racial injustice and police reform, given the explosive events in recent years in Baltimore, Ferguson and Los Angeles. I hope this film serves as a catalyst for dialogue, community-building and civic action, raising public awareness about these issues and resulting in real, positive change, real action. Talking sometimes is not enough." 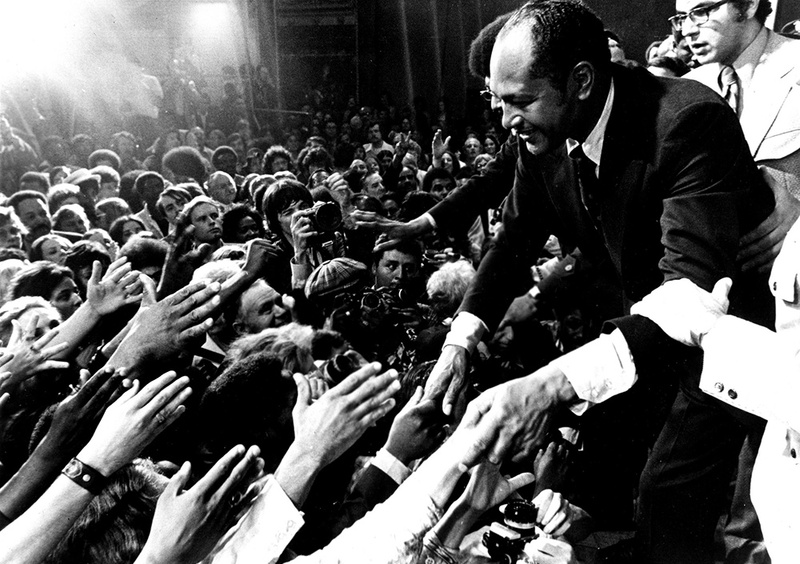 For some reporters and politicians, Tom Bradley was a man whose identity and ideologies were a paradox, hard to pin down or pigeon-hole. He was liberal when it came to issues of civil rights, but conservative with matters of finance; as a police officer he had a reputation for being a tough, no-nonsense cop, but also a fair one. It should come as no surprise that Bradley was a diplomat who possessed an innate ability to understand a situation by first listening to those around him, and then responding to the topic or issue at hand. He was religious but he was not a Bible-thumper; he was charismatic, but not full of himself; and he was also a black man coming up in what was for all intents and purposes a white man's world. But most importantly, he was a courageous man, a smart man. Goldfarb and Sotomayor hope that their film will serve as a catalyst for dialogue between different groups and interests within the community, and help the youth who may be wrestling with questions of race and identity. "Through dialogue, young people can gain a deeper sensitivity and understanding of racial and ethnic differences," Sotomayor asserts. To paraphrase it as the filmmakers themselves did during their respective interviews: A Jewish woman and a Latina did everything in their power to produce the best film possible with the cards they were dealt. Bridging the Divide airs on PBS stations beginning Feb. 1. Tom Gianakopoulos is a Los Angeles-based writer and photographer who was living in Koreatown during the Rodney King Riots of 1992. An employee of IDA at the time, he was tasked with transporting the May/June issue of Documentary magazine to the post office on the day the riots started.